Traditionally track feeder controls consisted of a twin dial clock, the 24 hour outer dial and a 60 minute inner dial. Although these clocks were the most popular choice unfortunately they are no longer available. Most operators are reluctant to use a digital time clock for track feeder systems due to complication of use and the ability to simply see when the next feed is due. 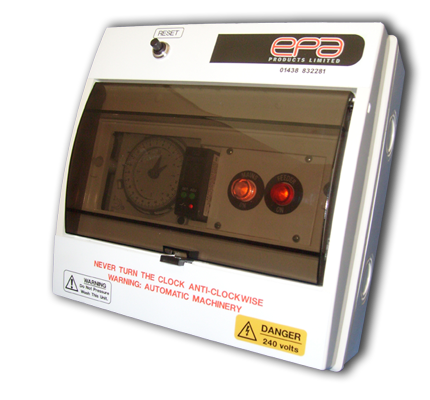 EPA Products Ltd has had a lot of experience with using time clocks for various applications within the poultry industry and one of the most common failures of analogue time clocks is dust and mite entering the inside of the time clock and jamming the internal gears. 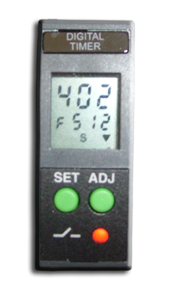 The FC5AD Track Feeder control addresses a lot of problems, feeder times are still controlled by a 24 hour time clock but the feed track interval run time is controlled by a digital timer, this allows for precision track run times and ease of operation by using a 24 hour analogue time clock. FITTED TO IP65 ENCLOSURE WITH HINGED OPENING LID FOR CLOCK AND TIMER ADJUSTMENT. TRACK FEEDER CONTROL CAN BE CUSTOM BUILT TO YOUR REQUIREMENTS.